The DeVilbissSleepCube Standard Plus is a fixed pressure CPAP designed for the effective treatment of Obstructive Sleep Apnoea. 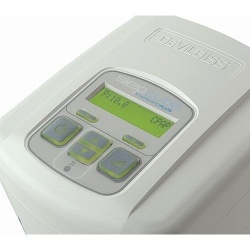 The DeVilbiss SleepCube Standard Plus features the innovative SmartFlex expiratory relief comfort feature for a more comfortable CPAP machine experience. The DeVilbiss SleepCube Standard Plus is equally suitable for use in the home or hospital and its robust ergonomic design and its small size makes it the ideal travelling companion. It is a fixed pressure device ranging from 3cm H2O to 20cm H2O. As with all SleepCube CPAP’s the optional heated humidifier can be easily connected.